These are the two posters I want to have critiqued by my partners. My audience is the 18-24 year old white americans who are not enrolled in college. Please comment your thoughts and ideas for final refinement. In attempting to identify a trope for your "rethink your priorities" poster, I would suppose that you're working with irony. 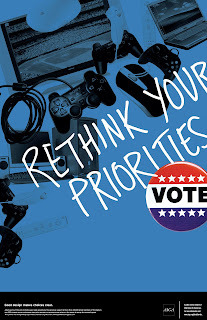 It's ironic that the priorities of a young person be based on video games and computers rather than educated voting. To this, your message is specific to your demographic. It's pretty self evident at this point. Maybe a paragraph of copy beneath your type could help the viewer step closer and read further. One aspect of your composition that you may want to consider is how your headline text is cooperating with the game controllers. You're beginning to do this with the pin, but I feel that you have an opportunity to be even more expressive with depth and overlapping of objects. Maybe you could add more "clutter" of controllers and cords, making them appear to be more of a hassle than good investment. I'm not positive what trope is being applied to your "request off" image. I could assume that you're applying hyperbole to convey exaggeration, but I feel that in this case you may want to let the viewer make some assumptions of their own. There must be another way of saying that so many people want time off from their job to vote. 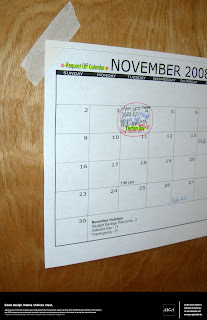 Using the calendar template doesn't give you much room for initial grasp of hierarchy or further read. In this direction, I'd consider re-shooting. Zooming deep into the calendar with a low aperture setting will help cut out the background noise and direct the viewer away from distraction. I believe the trope that your using is ironic as well because a lot of younger audiences are more worried about spending time on worthless things that aren't going to change anything. "Rethink your Priorities" is a good way of expressing this issue and I like the way that you hand wrote it relating to school and education. I think that Matt made a really good point about maybe working with opacity and layers to give it some depth and made a good point that it could relate to them being a hassle. The white mouse on the top it kinda bleeding in with the other image and is hard to see so maybe move it somewhere else to where its more legible. I like the overall composition and how it makes the eye scan all around and you could definitely explore that when you add more layers and opacities. Im not sure what trope your implying on the calendar one. The only thing that I think of is hyperbole because of the point of view. I like the idea because I know that one of the reasons for people not voting is because they say that they have to work or its conflicting with their schedule so you are directing the viewer to take that day off or write it down on their calender to remind yourself to vote. I think that it would be wise to explore reshooting like Matt suggested and explore some sort of text to make a pun or some other kind of trope? ?